Healthy Children > Tips & Tools > Ask the Pediatrician > Can I give my 5-year-old over-the-counter cough medicine? Coughs and colds—yuck! They make kids (and their parents!) miserable. The symptoms are uncomfortable, last a long time, and can make sleep a challenge. Parents want a fast way to get their little one back to his or her active, happy self. I feel for you and really wish I had a quick fix, but the truth is that there is no magic in curing the common cold. Over-the-counter cold medicine is not recommended for kids 4 and under. For kids 4 to 6-years-old only give them if your doctor tells you to. After age 6 the directions on the package can be followed (but be very careful with dosing). Also, since colds are caused by viruses, prescription antibiotics will not help. I recommend trying home remedies first instead of medicine for kids of any age with a simple cold. Why? Because over-the-counter cold medicines don't work well, and there are possible side effects. Bottom line—it's not worth it! Warm soup and teas can help soothe symptoms and make your child feel better. If your child has a stuffy or runny nose, the mucus running down the throat could be causing some of the coughing. A saline nasal spray and frequent nose blowing (instead of sniffling) can help—rub a bit of petroleum jelly (such as Vaseline) on the nose area every so often can keep the nose from getting red and irritated. A cool mist vaporizer can also keep the mucus moving. Be sure to clean the vaporizer well between uses. Another good cough remedy for kids over age one is a teaspoon or so of honey, which coats and soothes the throat—my mother always mixed this with a bit of lemon juice or into a simple herbal tea. Sound like an old wives' tale? It was studied! Sick kids who got a spoonful of honey before bed had better sleep and less coughing! For children 2 years and older, a mentholated rub can be put on top of the chest and front of the neck (throat area) to help reduce cough so kids can sleep. Mentholated rubs work differently than cough medicines that children take by mouth. The body's warmth helps the medication go into the air over time. The child breathes in the medicine through the nose and mouth to help soothe a cough. As with all medicines, as soon as you finish giving the medicine to your child, store it up and away and out of reach of curious little ones! Of course, plenty of rest and fluids help too. For kids 3 months to 1 year of age, 5 to 15 mL of warm water or apple juice can be tried 4 times a day. When your child has a cold, it is important to be patient. The first few days are the worst, but cold symptoms in kids can last for 2 weeks, with coughing up to 4 weeks. 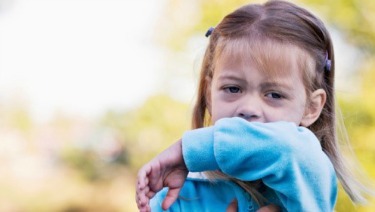 Most young kids get 6-8 colds a year―that's a lot of coughing and sniffling! I know you would do anything to make your child feel better but try to do your best not to treat your child's cold with too much medication! Remember, there is no need to treat a low fever (fever less than 100.4 F)—this is the body's way of fighting infection! However, if a fever is making it hard for your child to sleep or is making your child uncomfortable, it can be treated with acetaminophen (Tylenol) or ibuprofen (Motrin or Advil). Make sure to carefully follow the dosing instructions for these medicines. If your child has trouble breathing or swallowing or has a severe cough such as one that causes vomiting, call your doctor. Also, if your child has asthma, and your child has a nighttime cough—it could mean the asthma is getting worse. Your doctor will also want to see your child if your child's symptoms last a long time (cold symptoms for more than 2 weeks; cough for more than 4 weeks) or are not starting to get better after a week. High fevers (102 F or higher) could mean that there is a more serious infection. Sick infants (3-months-old or younger) with cold symptoms or a fever over 100.4 F should be seen by a doctor.